The innovative DCU-1 Pathfinder Digital Rotator control unit gives you automatic operation of your brake and rotor. 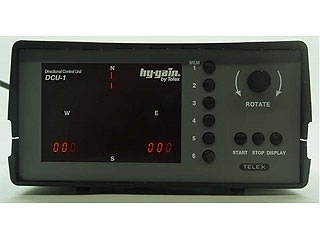 It has computer control with RS-232 passthrough and is compatible with many logging and contest programs as well. It has 6 presets for your favorite beam settings, 1 degree heading accuracy, automatic 8-second brake delay, and 360 degree choice for center of rotation. It operates at 110 VAC. The DCU-1 digital rotator unit is compatible with the T-2X, HAM-IV, and HAM-V families of rotators. See the DCU-1X for the 220 VAC version.